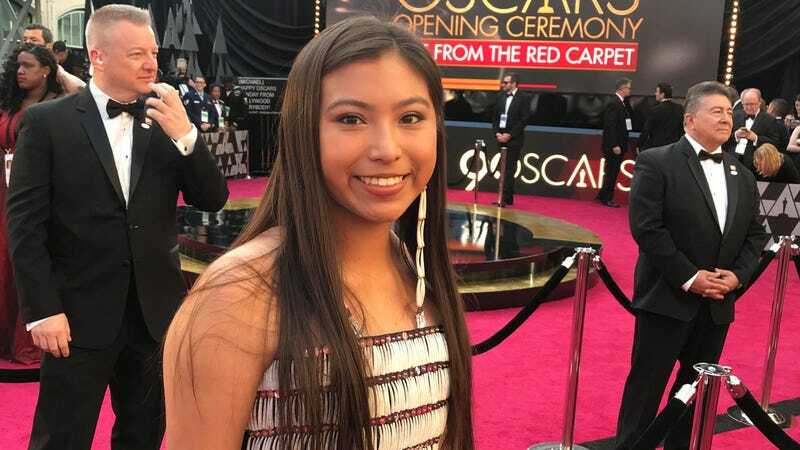 The Oscars are always a little political, but it’s not often that the awards shine a literal spotlight on an activist in anti-pipeline movement. Grammy-award winning rapper Common and singer Andra Day really turned it up Sunday evening with their performance of “Stand Up for Something,” an Oscar-nominated song for the movie Marshall. As they performed, spotlights beamed down on 10 different activists from movements across the U.S. One of those was Alice Brownotter, a 14-year-old member of the Standing Rock Sioux Tribe and prominent figure in the indigenous uprising the world saw against the Dakota Access Pipeline in 2016. In August 2016, Brownotter ran from North Dakota to Washington, D.C. along with about 30 other young indigenous people to help bring attention to the Dakota Access Pipeline. They delivered a petition with more than 140,000 signatures to the Army Corps of Engineers with a plea to halt the project’s construction. By now, we all know how that turned out: Trump steamrolled efforts to block the Dakota Access Pipeline even after former President Barack Obama ordered further review on the project, which has already seen at least five spills since its completion. Despite the recent shift in political winds, Brownotter’s spirit remains in the fight. She’s mostly focused on school at the moment, but she hopes that the work she and her peers did encourages more young people to speak up. She’s especially proud of the way young people in Parkland, Florida, are rising up after the school shooting that left 17 dead last month. Brownotter wasn’t even the youngest person to join Common and Day on stage: So did 8-year-old Bana al-Abed, a Syrian refugee whose tweets in October 2016 brought attention to the terror in war-torn Aleppo. Common and Andra Day’s performance during the Oscars. Brownotter, however, wasn’t exactly prepared to join al-Abed and the rest of the crew on stage. She had found out just last week she’d be attending the Oscars. A few days before the award ceremony itself, she found out she’d be on stage. As part of a performance. With celebrities. And did I already mention on stage at the Oscars? With just a few days notice? Brownotter quickly made plans to travel to Los Angeles with her aunt for an experience she’ll never forget. The world shouldn’t forget it, either.